This fabulous rich, fruity, German Christmas treat is utterly wonderful and bursting with flavour. As with all breads, you'll be doing quite a lot of kneading and waiting for the dough to rise, but the results are well worth the effort. Sift together the flour and the sugar in a large bowl. Mix well, then add the yeast, salt and spices. Mix together, and rub in the butter with your fingertips. Keep rubbing until it resembles breadcrumbs. Add half the milk and the almond essence. When the liquid is stirred in, add the remaining milk and mix until a stiff dough is formed. Tip out onto a floured worktop and knead for about 10 minutes, until the dough is silky and elastic. Add your currants, raisins, mixed peel and chopped almonds, a handful at a time. Keep kneading, stretching and pulling the dough until everything is evenly distributed. Place back in the bowl, cover with plastic film and leave in a warm place to prove (rise). Ideally you want it to double in size, and with enriched doughs like this, it will take longer than normal bread dough - at least a couple of hours, and possibly overnight. Roll out the dough into a large rectangle - if you are using a loaf tin, it should be the same width as that. Roll out the marzipan into a rectangle that's a bit smaller than the dough. Melt some butter and brush it all over the top surface of the dough, then place the marzipan on it, leaving a margin all round. Roll the dough and marzipan together (like a Swiss roll), moisten the open end with water and press down to seal it. Grease your loaf tin with butter and place the roll of dough and marzipan in it, seam side down. Some people prefer not to use any kind of tin - they just place the roll on a baking sheet. I'm not too keen on that method because the stollen will spread out into a shallow blob. Cover the dough and leave to prove again for an hour or two. Preheat your oven to 160°C (320°F) for a fan oven, or 180°C (356°F) for a conventioanl oven. Put the stollen in the oven, and bake it for about 50 minutes. After this time, check if it's done by inserting a skewer into the centre - if it comes out dry, the stollen is cooked, otherwise give it another 10 minutes. When the stollen is cooked, remove it from the tin. Brush the top, sides and ends with melted butter, and sift caster sugar all over it. Leave to cool on a wire rack, and then consume without guilt because it is Christmas, and it's allowed. The video above is from the Keef Cooks YouTube channel. 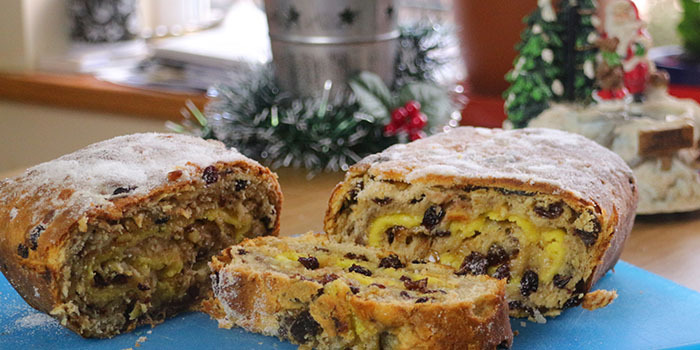 Click here to see the video recipe of Easy Stollen Recipe on YouTube. Extra butter and caster sugar for finishing. Prep time: 20 minutes. proving time: 4 hours.